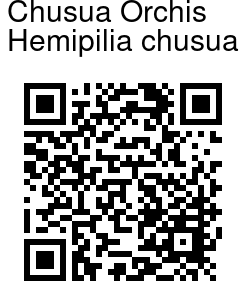 Chusua Orchis is a terrestrial orchid 12-26 cm tall. Leaves are two, unequal, arranged distance apart, 2 to 5 cm long and less than 1 cm in width, inverted-lanceshaped with broader base, stalkless and clasping. The lower more than twice long as the upper one. Flowers are 4-7 in a spike at branch-ends. Flowers are 2-2.5 cm long diagonally. Sepals are un-equal; dorsal smaller than the lateral, lanceshaped to ovate, arching over the petals, one nerved. Petals are slightly longer than the dorsal sepal, ovate, arranged forward with curving and over-lapping tip, one nerved. Lip distinctly and deeply three lobed, mid and side lobes as long as the lateral sepals; mid lobe narrow and short than the side lobes, oblong; lateral diverging, obelliptic with wider tip and sickle curve inner margins, tip margin with many wide round teeth. Spur longer than the lip and the ovary, slightly curved, cylindrical with wide base and tip, tip rounded. Leaf bract of varying size, diminishing towards the tip of the plant, lanceshaped, erect or horizontal, 1 to 4 cm long and less than 1 cm in width, three nerved, arising from the upper base of the ovary. Sepals and petals are pinkish white turning pale pink towards its tip with many irregular darker spots and markings. Lip of a darker pinkish shade throughout with a few distinct elongated spots on its base margining the mouth of the spur, the mid lobe also got few irregular markings of the same dark shade. 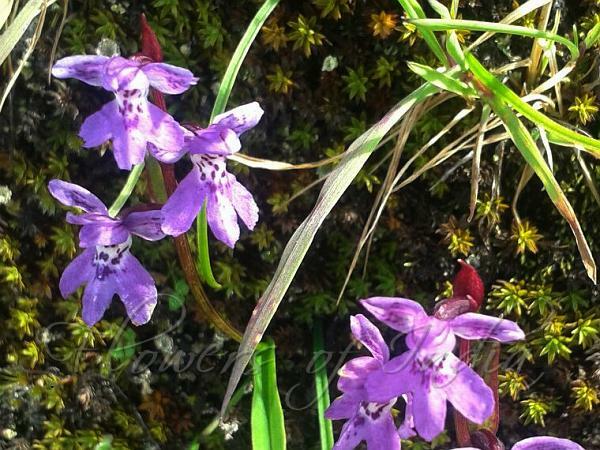 Chusua Orchis is found in the Himalayas, from Kumaun to Bhutan, NE India, Tibet, Burma, at altitudes of 2400-4900 m.
Identification credit: Nongthombam Ullysess, Pankaj Kumar Photographed in Arunachal Pradesh.